Wonderful talk by K Ramnath Chandrasekhar at Al Qamar Academy today. Ramnath, a young conservationist and photographer, spoke about how he got interested in wildlife as a young child. He pursued his passion and has traveled across India photographing wildlife and nature. He showed a documentary on the Sholas by Shekar Dattatri which outlined the immense diversity of wildlife in the Western Ghats and how it is being threatened by development. 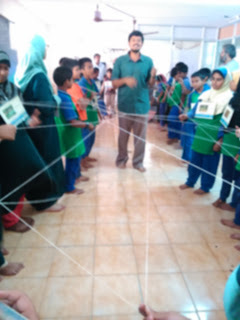 To help children relate to the complex interweaving of life, he organised an nice game where children roleplayed different parts of the forest and made connections using a large piece of twine with other creatures. So a flower connected to a butterfly which connected to a bird and so on. 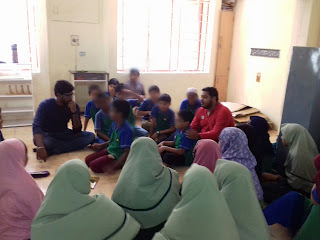 The question answer session which followed was lively with children and teachers asking about his profession, about animals, and about conservation. Most importantly, he stressed how everyone in their own professions and places can play a role in conservation. Children can reduce waste, can document the changes in the landscape, can create terrace gardens and backyard wildlife pools. Thanks Ramnath for a fabulous talk.